Q: What kind of didgeridoo works to treat sleep apnea and snoring? Any didgeridoo that plays easily and gets a clear consistent tone will work to treat sleep apnea. In the original study published in the British Medical Journal, a plastic didgeridoo was used in all trials. The 4-piece travel didgeridoo that comes with the Didge For Sleep Introductory Package is ideal for new players because it is lightweight and portable, maintaining a clear and loud sound that has been tested and approved by many seasoned didgeridoo players. Q: How much practice is required until results can be expected? Generally people who consistently practice for 30 minutes per day start seeing results within 3 months. We have also seen people get results as soon as 3 or 4 weeks into the practice. That being said, each person is different and results vary. From what we have observed, consistency in daily practice over time is the key. Q: What is circular breathing and do I need to learn it to see benefits? Circular breathing is considered an intermediate to advanced wind instrument technique and is NOT required to get the results offered by playing didgeridoo for sleep apnea and snoring therapy. This wind instrument technique allows the player to make a continuous sound, even while inhaling. For didgeridoo this is cited as one of the key elements because it is very characteristic throughout all traditional didgeridoo playing. For sleep apnea and snoring therapy, circular breathing is not necessary, however, it will enhance the practice and it will increase the therapeutic value. Q: Is there scientific evidence that the didgeridoo can help sleep apnea and snoring? Yes. In the first key study, published in the British Medical Journal in 2005, it was shown that participants who played the didgeridoo a minimum of 5 times per week for 30 minutes per day saw significant decreases in their sleep apnea and had better energy levels throughout the day. View the full report at DidgeProject.com. Q: How much does a didgeridoo cost? 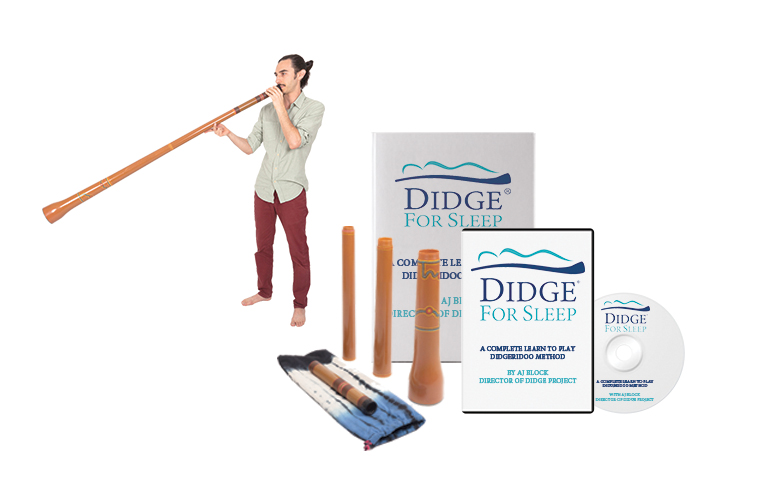 The Didge For Sleep introductory package includes a 4-piece travel didgeridoo which you can bring anywhere. Performance quality instruments generally cost $350 and up. Q: Are there any risks associated with playing didgeridoo? Like any physical practice, pushing too hard without properly developing the muscles and body structure can take a toll on the body. It is recommended that people who try the didgeridoo for sleep apnea and snoring start gentle and slowly work their way up to longer practice times. As a general rule, if you feel any strain or exhaustion, take a short break before continuing. Q: What learning options are there other than the Didge For Sleep video course? We offer private didgeridoo lessons and in-person learn-to-play didgeridoo events. See our services page for full details. Q: Are there other alternative treatments for sleep apnea and snoring? There are many lifestyle considerations that may impact the severity of sleep apnea and snoring. These include: diet, exercise, strength of the throat and tongue muscles, emotional state, sleep hygiene and more. One study showed that performing mouth, tongue and throat exercises led to significant improvement for people with sleep apnea. We support a holistic approach to sleep therapy that addresses multiple facets of life and behavior. Q: Is there such thing as a “quick fix” for sleep apnea? Long term problems require long term solutions. If sleep apnea and/or snoring have been occurring in your life for some time, it may take some time to treat them. Our observations show that disciplines such as daily practice of didgeridoo, good dietary decisions and proper sleep hygiene, when performed consistently over time, will help to alleviate snoring and sleep apnea. While playing didgeridoo is certainly not a “quick fix” for sleep apnea and snoring, commitment to the practice will provide you with a powerful access to reclaiming your rest.